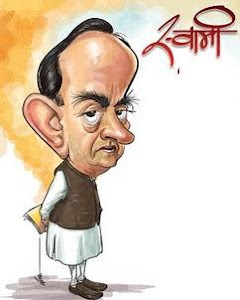 Know your Swamy: The massive operation which brought the fascist,ruthless government down!!! The massive operation which brought the fascist,ruthless government down!!! What was your role in the collapse of the Vajpayee Government? It was a massive operation in which many people had many roles. It is for others to talk about my role. What they perceive is good enough for me. How would you explain the April 17 vote? It is a happy ending. Industrial houses, some multinationals, and of course, George Fernandes, (Ram) Jethmalani, the PMK, the MDMK and various rebel groups such as the LTTE, the Tibetan secessionists and the Myanmar rebels, had a self-interest in the survival of the Government; a massive combination of corrupt industrialists, terrorists, and an immoral and ruthless RSS. Three people made the maximum contribution - Jayalalitha, Sonia Gandhi and Mayawati, in that order. Jayalalitha staked her entire political and physical future. She was in the Government and she sacrificed that position. She ran the risk of opposing the Government. Had the attempt to bring down the Government failed, there would have been DMK participation in the blood-thirsty, ruthless, fascist Government in Delhi. She was immune to the offers by corrupt industrialists. She was incensed by the sacking of Vishnu Bhagwat. It was purely a patriotic reaction, and had nothing to do with the dismissal of the DMK Government in Tamil Nadu or the (corruption) cases against her. She is doing quite fine as far as the cases are concerned. And she has issued a statement saying that the dismissal of the DMK Government was not an issue. Sonia Gandhi lent a helping hand. Had she not turned up for the tea party that I hosted, the entire plan would have collapsed. But despite the advice of people close to her, she kept her own counsel and acted. Mayawati's was a case of political bravery. Going by the rates mentioned, the five BSP MPs, according to the gossip mill, would have been entitled to Rs.50 crores. She had no stakes, in the sense that there is no love lost between her and the Congress(I) and the BJP. She was against the BJP continuing in power. She resisted the pressure that was brought to bear on her, including threats against the Scheduled Castes in Uttar Pradesh and the offer of chief ministership. They were willing to offer any price, but she resisted. She is a brave lady. But Mayawati has denied that the BJP made any offers. Well, there was no need to. The BJP had no nerve to contact her directly. Rangarajan Kumaramangalam approached her in the presence of everybody in the Lok Sabha, and I overheard him offer to fix this or that. I was seated right behind Mayawati. How did you bring the three women together? It so happened that I was placed in a position to do so. I have been Jayalalitha's loyal ally. And I am known to the three women personally. They think I am fair and straightforward. That's why I was able to talk to them. Ultimately each of them was motivated by the national interest. They should get the lion's share of the credit. You have also been Jayalalitha's bitter critic. She was in power then. I was in the Opposition. There was no personality clash. Vajpayee is on record as having called Prakash Singh Badal a terrorist.